The Harpa in Reykjavík, Iceland, has become both a landmark and a cultural gem. Home to the Iceland Symphony Orchestra and The Icelandic Opera, Harpa hosts a variety of events including Iceland’s presidential elections and debates. Harpa was designed by Henning Larsen Architects, a Danish firm, alongside Batteriio Architects and the Danish-Icelandic artist, Olafur Eliasson. Known for his sculpture work and his expert manipulation of light, Eliasson’s artistic influences are best showcased through the exterior. The building is adorned with geometric glass panels of different colors, which give the building a unique shimmering effect. 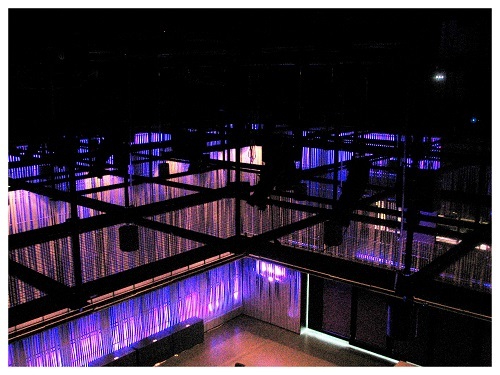 At night, the venue utilizes LED lights to enhance the brilliance of the sculptural work. Inside, unique lighting showcases each space as an individual work of art. Harpa won the European Union’s Mies van der Rohe award for contemporary architecture in 2013. Working with project consultant, Artec Consultants, NY, InterAmerica Stage, Inc. designed and supervised the installation of SkyDeck™ in the Norðurljós Recital Hall. The project required a variation on the typical SkyDeck™ design. Each panel was custom made as a perfect square, creating a uniform repeating pattern across the ceiling. The end effect is a modern, industrial look which plays very nicely with the overall design of the building. The SkyDeck™ system extends over 3,200 square feet providing complete coverage and easy access to the custom lighting system. Load-ins for events are much faster because the two-story event space can be set up below while work continues safety overhead. 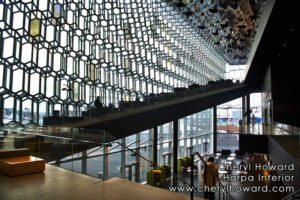 If you’re in the area, we highly recommend you take a visit to Harpa and see the splendor for yourself!